Canmore Real Estate News: BRILLIANT CAMPING HACKS TO MAKE LIFE EASIER! Your summer household chores are all done and now it is time to go camping. The great outdoors, the campfires, the food you’d never eat in civilized society: it’s a wonderful experience. That said, things can get a little bit tricky when we are left to the mercy of Mother Nature. Here are 30 fantastic camping hacks you can use to make your camping experience as wonderful as possible! 1. Use sage to repel mosquitoes. Place some sage in your campfire and the smell is sure to ward off any pesky mosquitos. 2. Liquid soap + cotton balls = no ticks. If you or one of your fellow campers is having trouble with a tick, place the soap-soaked cotton on the tick for 20 seconds. The tick will eventually stop chewing and will come away with the cotton ball. If the tick was attached for a lengthy amount of time you may want to consider keeping it in a container so that you can test it for Lyme disease later. 3. Use an acorn cap as a whistle if you get lost. It’s remarkably easy to get lost whilst camping. Here’s a full tutorial on how you can transform an acorn into a whistle! 4. Corn chips for kindling! Doritos are a great way to start a fire, just be careful! 5. Use the rest of the chips for nachos. Nachos are easy to pack, light and simple to make. Plus they’re incredibly tasty. 6. Use compact, microfibre towels! These towels are incredibly easy to store and dry within an hour of use. 7. Wrap duct-tape around your water bottle for emergencies. You never know when you might need some. 8. Make lamps out of jars and solar disks. Prepare before you go and put it in mason jars, ready to drink! We know what’s really important. 10. One water bottle will hold eight eggs. By keeping all your eggs in a bottle you save time and hassle. Plus, no need to carry extra bowls or a whisk! 11. Johnson’s Baby Creamy Oil is a surprisingly good mosquito repellent. Keep the bugs and the bug repellent smell at bay. All you need is a watering can and a large jug. 13. Keep sandpaper handy to light matches. Glueing some sandpaper to the lid of a tupperware box where you can also store matches is a foolproof plan. Take an oreo, twist it open, add chocolate and marshmallows. Voila! A S'moreo. Just sprinkle grits wherever you see ants. 16. Deodorant can be used to combat itchiness from mosquito bites. 17. Wrap your meat in cabbage to stop it from burning. The moistness in the cabbage creates the perfect barrier. 18. Foam noodles will stop any injuries. For any fellow clumsy people, you know how possible it is to smack your head and cause serious injury. Placing a foam noodle on the awning strut narrows down at least one accident waiting to happen. 19. Carry some essentials in a small tin with you at all times. You never know what you’ll need and when. 20. Take toothpaste dots instead of a whole tube. Place small drops on a sheet of wax paper. Let the drops dry out over 3 days, add a little baking soda and put them in a resealable bag. 21. Use a stick to secure your tent. By placing a stick in the main centre line you ensure the pressure is even throughout, which will stop the grommets being pulled out. 22. Vacuum seal your food before you leave. 23. Popcorn on the campfire. Jiffy Pop is great popcorn that you can place on the stove at home can also be popped over a campfire..
24. Keep your toiletries handy on a clip string. Get them while you can with the summer seasonals! 26. Tic-Tac boxes are great for storing ingredients like spices and salt/pepper. 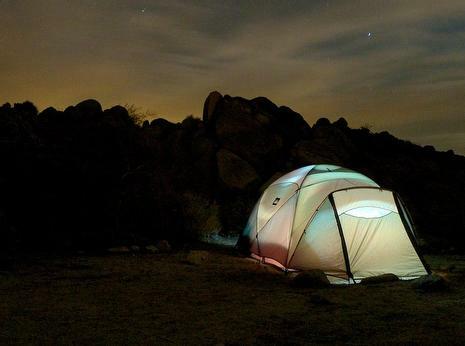 With these tips and tricks, you can work DIY magic into nearly every aspect of camping, and make your next camping trip a comfortable, easy blast. Good luck!